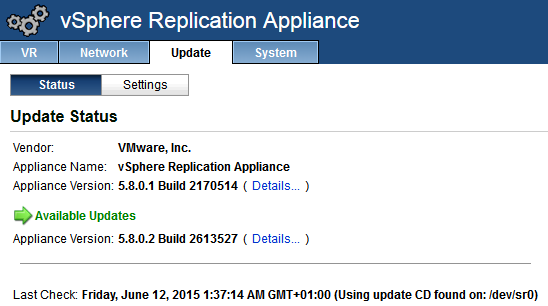 You cannot upgrade vSphere Replication 5.1.x directly to version 5.8. You must upgrade from version 5.1.x to 5.5.x or 5.6 first, and then upgrade from version 5.5.x or 5.6 to 5.8 by using the ISO image for vSphere Replication 5.8. You cannot downgrade to a previous version of vSphere Replication. Login to vSRA as root. If previous upgrade got stuck at “Checking for available updates…” and Check Updates button is greyed out even after restarting the vSRA, please refer to “VMware vCloud Connector Server upgrade” article for details.